Despite mounting layoffs and the availability of unemployed workers, there is an acute talent shortage and mismatch of skills in the Asia-Pacific region and this is part of a global phenomenon, according to Right Management, a part of global employment services giant ManpowerGroup. Speaking to BT, Right Management's Ronnie Tan noted that the ManpowerGroup's 2012 Talent Shortage Survey found that 45 per cent of employers in the Asia-Pacific region are having difficulty in sourcing the right talent - considerably higher than the global average of 34 per cent. "Birth rates are declining and populations are ageing. This means that there is a smaller pool of working-age talent to draw from. The lack of available skilled talent will continue to put a drag on business performance," said Mr Tan, who is Right Management's group executive vice-president, Asia-Pacific & global talent management. Jobs like those of engineers, technicians and various IT roles are among the five most difficult to fill in the Asia-Pacific region, and employability skills continue to vex employers. Interestingly, Mr Tan noted that Singapore's vital electronics sector, which contributes 25 per cent to manufacturing value-add and employs around 80,000 people, is not that badly affected by the labour crunch due to high levels of automation. However, a labour crunch still exists in areas where highly-skilled manpower is in demand. "For example as semiconductor technologies become more advanced, systems and processes are also becoming more complex to manage and hence companies need the right talent and skill-set to manage these," Mr Tan explained. 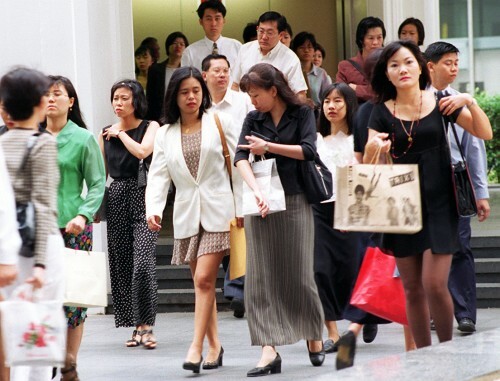 The ManpowerGroup's employment outlook for the second quarter showed a modest turnaround in the net employment outlook - 24 per cent of employers in Singapore indicated that they intended to increase headcount. Labour demand is expected to pick up with a more optimistic hiring outlook in the services, public administration and education sectors. Labour demand in construction is also expected to remain firm due to a large number of planned public infrastructure and residential projects. Interestingly, the sectors most dependent on foreign workers in Singapore are also the ones most behind international productivity standards. Mr Tan observed that the recent policy changes will result in reducing reliance on manpower and not just foreign workers. This will significantly improve productivity and avoid an indefinite increase in the ratio of foreigners in our workforce, he said. In the short term, costs will increase for companies as steps are taken to align with the changes in employment policies and as businesses look to increase productivity. "However, we need to understand that in order for Singapore to sustain its growth and development as it further transforms and moves up the value chain in the region, high skill talent is what is needed", he said. He noted that the global talent mismatch will continue to challenge employers, and companies will have to navigate the continued growth of emerging markets, globalisation and the expanded use of increasingly sophisticated and rapidly changing technologies. "Emerging trends put unprecedented value on talent as the driver of business success. This will only increase the competition for proven, talented employees with skills employers need. Furthermore, individuals with in-demand skills will become more selective as they evaluate their employment options, compelling companies to develop better recruitment and retention strategies. "Similarly, this lack of talent will force organisations to adopt a new mindset regarding talent development, where upskilling their existing employees and developing candidates with potential becomes the norm rather than the exception," Mr Tan said. Companies are already adapting and considering a range of strategies to address talent shortages. The most common is additional training and development for existing staff, said Mr Tan. The proportion of employers pursuing this approach is up slightly across the region from 17 per cent in 2011 to 19 per cent in 2012. Employers in China (27 per cent) and Japan (22 per cent) employ this strategy most. Mr Tan added that approximately one in eight Asia-Pacific employers (13 per cent) are prepared to recruit outside their local region to address workforce gaps, most notably in Taiwan (23 per cent). Among the subset of employers saying that talent shortages are having a high impact on their businesses, employers in the Asia-Pacific region - more than in any other region - are focusing on improving their talent pipelines, such as identifying those with high potential and building a succession management approach. "More employers should consider this longer-term approach to developing talent to help solve global talent mismatch," Mr Tan said.